The evidence of possible liquid water on Mars, announced today (Aug. 4), has scientists newly excited about the Red Planet's potential to host some form of primitive life, scientists say. The discovery comes from the Mars Reconnaissance Orbiter (MRO), which spotted slopes carved into the Martian surface that appear to most likely have been created by the flow of liquid salt water, NASA announced today (Aug. 4). 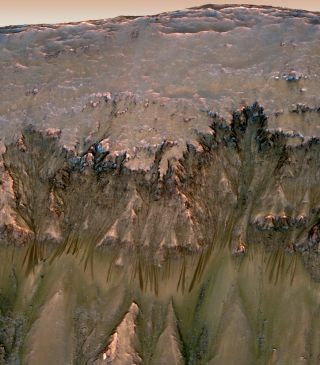 The slopes appear to change over the course of different seasons on Mars, suggesting that liquid water, if it exists at all, is only present in the Martian spring. "It hasn't been a question for some time now that there's ice on Mars," geophysicist Philip Christensen of Arizona State University in Tempe said today during a NASA press conference. "What makes these new observations so interesting is that they occur at much lower latitudes where temperatures are much warmer and where it's actually possible for liquid water to exist." Liquid water is the Holy Grail for scientists hunting for life beyond Earth. All life on this planet relies on liquid water, and experts think extraterrestrials likely do, too. And Mars, as the planet next in line after Earth from the sun, is one of the top potential habitats for ET. "I think this is an eye-opening discovery that will really help us begin the planning process for future missions specifically looking for signs of the presence of life on Mars," biogeochemist Lisa Pratt of Indiana University at Bloomington said. The new discovery, however, offers the tantalizing hope that life might exist on Mars' surface, and thus, signs of its presence, such as the release of biologically produced chemicals, could be visible to us. "It is our first chance to see an environment on Mars that might allow for the expression of an active biological process if there is presently life on Mars," Pratt said. Pratt suggested looking for chemically produced gases such as methane or hydrogen sulfide, or oxidized gas such as oxygen. And if it works in Siberia, why not on Mars? Before getting too excited about finding ET on the Red Planet, though, scientists cautioned that more observations and experiments are needed to confirm the water's presence. "We have this circumstantial evidence for water flowing on Mars," said Alfred McEwen, a planetary geologist at the University of Arizona, Tucson. "We have no direct detection of water." Still, scientists now have a better idea where to focus their searches for liquid water, and life, on Mars. "For me, this is sort of the beginning of the scientific process here we've just started," Christensen said. "There's questions regarding these observations, but now the scientific community can really turn to them and really begin to probe the details of what these observations are telling us."